The scary part of figure one is that the transmission was truncated by rapid signal fading! It turns out to be an administrative fax, so no worries. At first glance it attracts serious attention though! OK, so the ladder line may not be an absolute prerequisite for the loop, while it’s receiving faxes. But, for transmitting CW, it could be very useful. The full wave loop presents an impedance of about 120 ohms, so balanced line can be used with it, or alternatively a Q section of coax. I didn’t have any spare coaxial cable, so I cut some lumber. For transmitting (should I contemplate that) – I could use a closed full wave loop on the fundamental frequency, and an open full wave loop on half the fundamental. 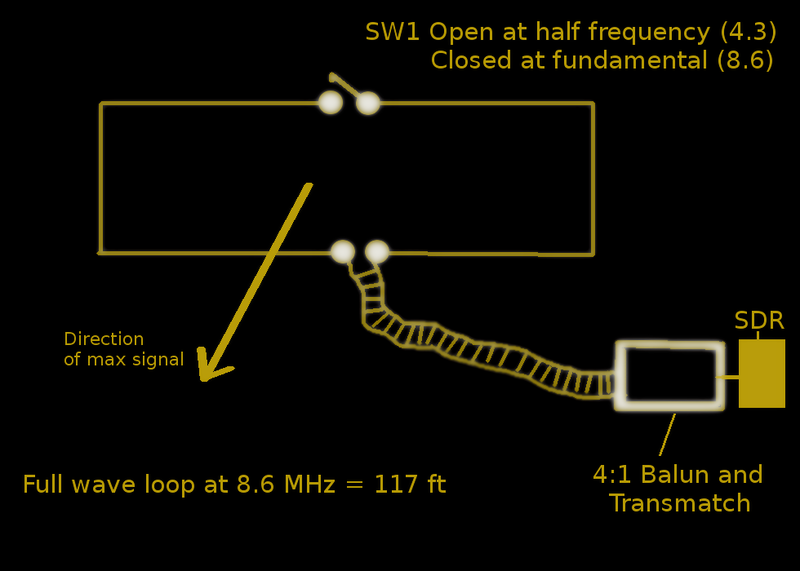 Either way, it would be possible to achieve a 2:1 or less SWR from the perspective of the transmitter, assuming a 4:1 balun for the case of the balanced line, which by good fortune the MJF 941D does have. Also, I’d need to add 13.5 feet of loop wire to each side of the loop, since it is currently tuned to 8.6MHz (FW) / 4.3MHz (HW) – which was the result of its having a total length of 117 feet. To slide the resonance frequency over to the forty meter ham band (7 MHz) – the additional 13.5 feet of length is needed in each leg. The problem is that attic space generally does not accomodate FWL antennas very well. For now, we’re stuck with a pretty good antenna at the fundamental (8.6 MHz) and a so-so receiving antenna at half of the fundamental (4.3 MHz). The loop was used at half frequency for all of the faxes shown on pages 2, 3 of this blog series. It beats the loaded dipole quite readily, whether the top tap is open or closed (see the schematic at the bottom of this page). 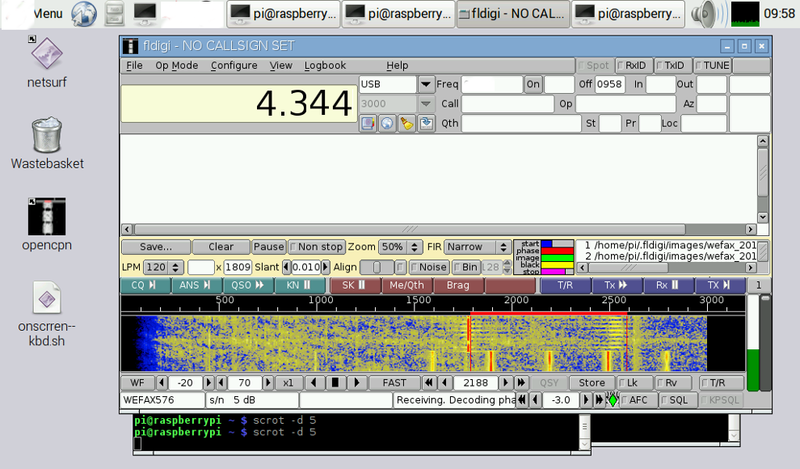 Figure 2: The tablet has half the functionality of the SDR. It is shown here in my photo studio (the top of my washing machine). Click to enlarge. Tablet #2 of 5 (the Pi2 powered one) is shown with my scribblings in place of proper decals. 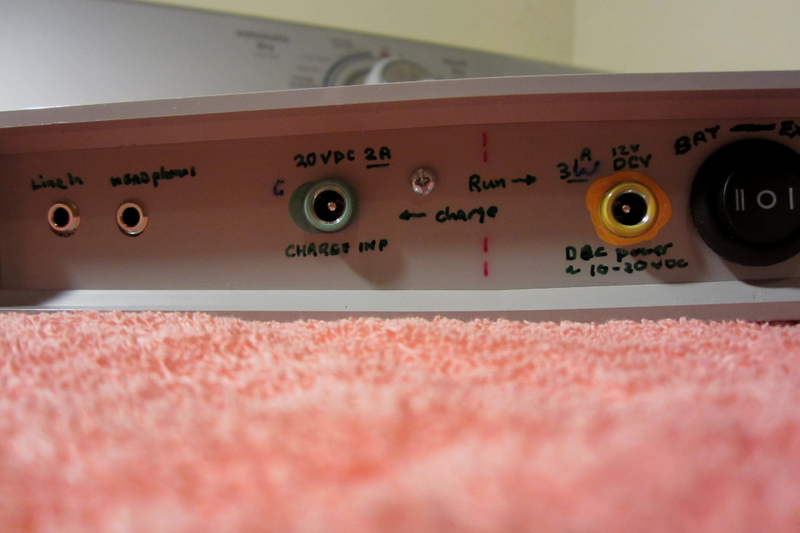 I changed the internal circuits repeatedly, which is why there are two jacks for power. Actually either one can be used now, by any supply up to 30 VDC, for both charging or running. For the loaded dipole, I started with antenna resonance at 7 MHz (a basic forty meter dipole), and then added the loading coils (one coil midway inside each leg). This provided relatively poor receiving results on 4.3 MHz. Talking about the loading coils does bring up a point. Some hams think that you simply take the missing length (normally needed for resonance when using a straight piece of wire) – and wind it onto a couple coils. Wrong! What you really do is add a coil of the appropriate inductance needed to make the antenna tune. And, inductance decreases with turn spacing, no matter if the number of turns is the same. There you can play with any combination you like, to get the required inductance (but it will always be less than the missing wire). So, loops are in, dipoles are out. The loop fits into an attic better than a dipole (unless the dipole is loaded, which we decided was not good for receiving). True, you can bend the ends of a dipole, but that is bad for dipole efficiency. The bend in a loop is good for loop efficiency. That all holds water unless you’re talking about an open loop used at half the fundamental, and that might seem like nothing but a really really bent dipole. When phases are taken into consideration tho – it isn’t. Figure 3: Tuning bars at start of transmission, for New Orleans Weather Fax. Click to enlarge. In figure 3, we see the tuning bars that are present at the start of a transmission. They allow the tuning needle (the one that the software provides in the graphical display) – to be aligned for maximum signal and best white/black alignment. This shot shows only a 5 dB SNR, but I’ve seen as high as 35 dB indicated on the display while using the loop, which is broadside (favorable) to New Orleans from here in North Carolina. Another benefit of the loop is that it is quiet – less noisy compared to the dipole. I’ve operated the loop closed and open at half frequency, but am hard pressed to say there is much difference at all in received signal when running half the fundamental. Still, it performs better than the loaded dipole. And – the loop is much less noisy. I think part of the signal improvement over the dipole is simply due to putting “more wire in the air” – versus the loaded dipole, where the capture associated with the coils is equal to nothing. AFAIK, the theoretical gain of a single full wave loop is 2 dB. I guess I could put up a beverage antenna. Figure 4: the loopy arrangement here for weather fax. So, is the little SDR OK for weather fax, or should we just buy an expensive (relatively speaking) shortwave radio? I’m thinking I’ll have a regular receiver in the shack for serious WX, while continuing to improve the SDR sidecar as I can. The ability to control tuning and decoding via a tablet is very nice, and is a feature not built into cheaper or more moderately priced shortware radios.